MOSCOW – The 2026 World Cup will be held in the United States, Mexico and Canada after FIFA’s Congress voted overwhelmingly on Wednesday to back the tri-nation joint bid to host the tournament, with Morocco missing out for the fifth time. The 2026 finals will be the first expanded tournament featuring 48 teams, up from the current 32-team event which begins in Russia on Thursday. Both bids were given a last chance to make their case with 15 minute presentations in front of the Congress at the Moscow Expocentre. The North Americans pledged their tournament would generate an $11 billion profit while Morocco, which has now failed in five bids to host the World Cup, said theirs would make five billion. Although it will be the first World Cup to be hosted by three nations, the vast majority of matches will be held in the Unites States. Of the 80 games, 60 will be held in the U.S. with 10 each in Canada and Mexico. The final will be played at MetLife Stadium in New Jersey, home to the National Football League’s New York Giants and New York Jets. Ten of the eventual 16 chosen venues for the tournament will be in the United States with Mexico and Canada having three venues each. The U.S previously hosted the World Cup in 1994 while Mexico staged it in 1970 and 1986. Canada has never staged a men’s World Cup but it did hold the women’s tournament in 2015. A U.S. bid lost out in the vote eight years ago for the 2022 World Cup, which was handed to Qatar, and U.S Soccer Federation president Carlos Cordiero said it had been a long road to get the tournament back to the country. “It was overwhelmingly emotional for everyone, not just for myself. A lot of very hard work and effort has gone into this campaign… You know, we ran and lost eight years ago. We appreciated that as much as you can do, you are not guaranteed victory,” he said. Intriguingly, the United bid won the vote of Russia who had previously been behind the Moroccan effort. “We had a clear path to victory which involved garnering support from all confederations, including, I might add, Africa,” said Cordiero. “We feel good today with the result, some (votes) came our way in the last 72 hours, not just Russia,” he said. Both U.S. President Donald Trump and his Mexican counterpart Enrique Pena Nieto took to twitter to express their delight at the win. The Moroccan bid had expected a closer result and some of their backers felt they had been let down by potential allies. “Of course, it’s really sad because we were counting on our friends, the countries that are close to us, that are long-time friends. And today they betrayed us,” Moroccan Olympic champion runner Hicham El Guerrouj, who was active with the bid team, told Reuters. The last time FIFA voted on World Cup hosting rights was in 2010, the decision then resting with the old executive committee which chose Russia to host the 2018 finals and Qatar for 2022. Several members of that committee were later banned from the sport after they were caught up in the corruption scandal that engulfed world football’s governing body in 2015. Under FIFA’s new system for choosing the host, all eligible football federations who attend Congress were given a vote. The result has been a jet-setting campaign from both bids, whose team members have travelled the globe in an attempt to win over the worldwide electorate. Cordeiro has said his bid would generate $14 billion (10.5 billion pounds) in revenue and make an $11 billion (8.2 billion pounds) profit for FIFA. The bid also expects record ticket and hospitality revenue. 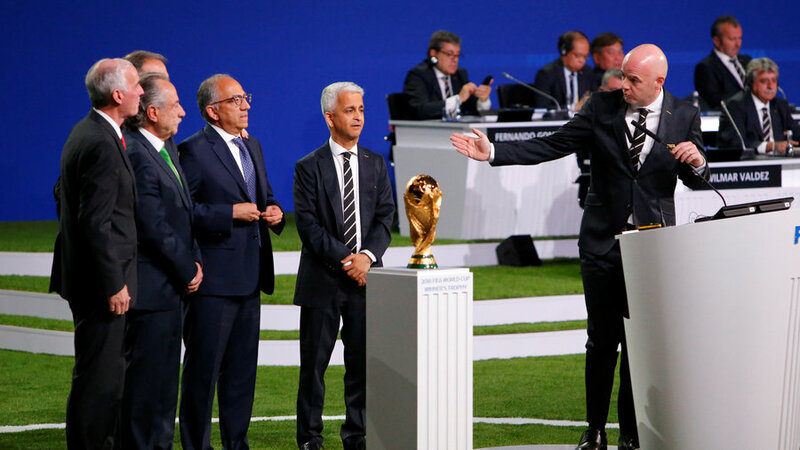 The result is a boost for FIFA president Gianni Infantino who, while he maintained neutrality during the campaign, was known to be keen to see the first expanded Word Cup being held in North America. The 2018 tournament kicks off in Moscow on Thursday when Russia play Saudi Arabia.